Chilli Garlic Tofu Snack is just a name I use to describe this dish because I am unaware whether there is an original name to this dish. Just like the Ikan Bilis Snack, this is another one of those easy to cook yet delicious food. And extremely affordable too. The garlic gives this dish an aromatic flavour whilst the use of chilli and white pepper powder gives this dish a slight spiciness to it. If you intend to serve this dish to kids, just omit the use of chillis and white pepper powder. It tastes just as great. Try it will ya? 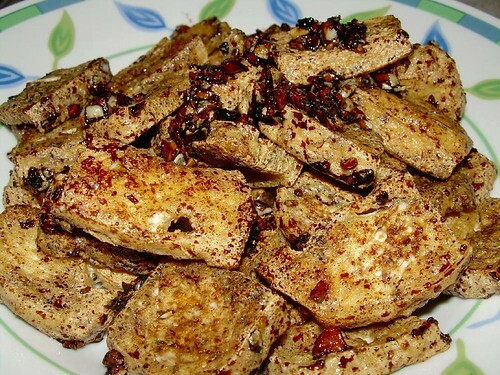 Heat oil and fry tofu till golden brown and crisp using high heat. Remove fried tofu and discard oil. The wok should still be coated with oil at this moment. Add garlic and chilli and saute till aromatic. Return fried tofu to the wok, add seasoning and stir well to coat evenly prior to serving. I just made this recipe. It is a delicious and quick way to enjoy tofu. The crunchy quality of the fried tofu works well with the sweet and sour sauce. Nice one! Must say these recipes you have are really easy and delicious. Tried most of the recipes except Japanese tofu with minced meat. Looking forward to more recipes like these. Keep up the great work. Thank you!! !